Although there is a relationship in a large group analysis between the age at onset/motor severity of FXTAS and CGG repeat size10 with increasing risk and severity at higher repeat lengths, the CGG repeat size alone does not fully explain risk. Women have a protective normal X allele, and hence, the propensity for developing FXTAS is different between men and women. In carrier women, a higher activation ratio (AR) (percentage of cells expressing the normal FMR1 gene) may lower the presence and severity of motor signs of FXTAS.10,–,12 It is probable, however, that there are additional secondary genes, medical conditions, and environmental factors that affect the effects of the premutation expansion and contribute to the risk of developing symptoms. A second gene, antisense FMR1 (ASFMR1) overlaps a portion of the FMR1 gene including the CGG repeat sequence, is transcribed in the reverse direction from FMR1 with 5 splice variants of unclear exact clinical impact.13 One of the variants previously described13 ASFMR1 splice variant 2 (ASFMR1 transcript variant 2 [ASFMR1-TV2]) was further explored in this study. Elevated levels of the expanded GCC repeat–containing ASFMR1 transcript are observed in premutation carriers (PMCs),13 and small unpublished studies have suggested that certain splice variants of the ASFMR1 transcript are associated with the presence of neurologic symptoms in PMC men with FXTAS. Within the CGG repeat element of the FMR1 gene, there are AGG trinucleotide interruptions (typically separated by 9–11 CGG repeats), which are known to disrupt the otherwise pure CGG repeat motif. Normal FMR1 alleles typically possess 2 or 3 AGG interruptions; premutation alleles generally possess 2 or less interruptions, whereas larger premutation alleles tend to have fewer AGG interruptions. The loss of AGG interruptions is believed to increase the probability that large normal and small premutation size alleles will be unstable on transmission and expand to a full mutation allele on transmission from small or moderate size alleles.14 The rationale for investigating AGG interspersions is that pilot data from our group show that a lack of AGG interspersions is associated with neurologic signs. In this study, we hypothesized that elevated specific splice variants (ASFMR1-TV2) of the ASFMR1 transcript and a lack of AGG interspersions may play a role in FXTAS, and we attempted to determine the correlation between these features in development of clinical symptoms in FXTAS. This study received approval from the Institutional Review Board at the Rush University Medical Center. Written informed consent was obtained from all patients (or guardians of patients) participating in the study. The family history of FXS from participants (but not FXTAS or other neurologic conditions in the family) was obtained. Skin biopsy was performed under sterile conditions and delivered to the laboratory immediately for processing. The skin biopsy was placed in culture media and later diced under sterile conditions on a culture plate and then plated in T25 flasks in CHANG-Amnio™-Medium (Irvine Scientific, Santa Ana, CA), The flasks were incubated at 37°C with 5% carbon dioxide. After cells grew out, longer-term cultures were maintained in Corning™ cellgro™ Cell Culture Media–Dulbecco's Modified Eagle's Medium supplemented with 10% fetal bovine serum (Gibco) and 1% Gibco® Antibiotic-Antimycotic (containing 10,000 units/mL of penicillin, 10,000 μg/mL of streptomycin, and 25 μg/mL of Gibco Amphotericin B). Aliquots of all cell lines were frozen and kept at −80° for long-term use in future studies. RNA was purified using the Qiagen RNeasy kit from blood or fibroblast samples. Samples were treated with DNase and screened for contamination; then, complementary DNA (cDNA) synthesis was performed using the High Capacity cDNA Reverse Transcriptase Kit from Applied Biosystems, Foster City, CA. The defining characteristic of ASFMR1-TV2 is the 84-nucleotide deletion near the beginning of the open reading frame and does include the repeat. The 84-nucleotide deletion excises an AUG associated with a stronger Kozack sequence than the proline reading frame.13 Because the AUG for the polyproline frame is retained and competition is reduced, this potentially enhances the polyproline reading frame on ASFMR1-TV2.13 Relative expression of ASFMR1-TV2, nonspliced ASFMR1, total ASFMR1, and total FMR1 mRNA were quantified using the VIIA 7 real-time quantitative PCR system (Applied Biosystems). The results were calculated using a “Delta-Delta CT” (ΔΔCT) algorithm (first Delta CT [ΔCT] = [target expression] − [Gus-B expression]; second Delta CT [ΔΔCT] = [ΔCT] − normal control [NC]; fold increase of target vs NC = 2−(second delta CT) = 2−ΔΔCT; fold increase = 2−ΔΔCT) to compare relative expressions of target mRNA to the expression of the GUS-B control mRNA and then to the expression of an NC sample (primers and probes in table e-1, links.lww.com/NXG/A58). Analysis of variance (ANOVA) or the Kruskal-Wallis test (where appropriate) was performed to compare the levels of ASFMR1-TV2, nonspliced ASFMR1, total ASFMR1, and total FMR1 among NCs, PMCs without FXTAS (PMC), and PMCs with FXTAS (FXTAS). The sample size calculation was based on ANOVA comparing NCs, PMC without FXTAS, and FXTAS. Pairwise comparisons were conducted with Bonferroni adjustment for multiple comparisons. The FXTAS-RS scores were compared among different clinical phenotypes with ANOVA or the Kruskal-Wallis test. Receiver operating characteristic (ROC) curve analysis was performed to evaluate the performance of ASFMR1-TV2 to discriminate patients with FXTAS from others (NC and PMC). The following guide was used for interpretation: excellent 0.9–1; good 0.8–0.9; fair 0.7–0.8; poor 0.6–0.7; and fail 0.5–0.6. The Spearman correlation was used to examine the relationship between the CGG repeat size and the ratio of the splice variant and total ASFMR1 mRNA (table e-2, links.lww.com/NXG/A58). Least absolute shrinkage and selection operator (LASSO) logistic regression was performed to examine the association of the splice variant, CGG repeat size, AGG interruptions, nonspliced ASFMR1, total ASFMR1, FMR1, and family history of FXS with FXTAS adjusted for age. LASSO regression was used in this study to select the strongest predictors. AR was included in the regression for woman. Data for men and women were analyzed separately because the penetrance of FXTAS is much higher in men than in women. Missing data were excluded from the analysis. One hundred thirty-five participants including 56 men (mean, SD years; 65.2 ± 12.1 years) and 79 women (55.2 ± 15.5 years) were recruited. Men comprised 66% of those participants who met the criteria for FXTAS, 21% of PMCs without FXTAS and 45% of NCs. Twenty-six participants who met the criteria for FXTAS, with a mean age of 71 ± 8.4 years, had a median CGG repeat length of 91.5 (interquartile range [IQR] 29) (table 1). Twelve PMC participants without FXTAS, with a mean age of 61 ± 11.8 years, had a median CGG repeat length of 78.5 (IQR 21). Eighteen NCs had a mean age of 59.7 ± 13.6 years and a median CGG repeat length of 30 (IQR 10). Men with FXTAS were older than PMC and NC, and the CGG repeat size was higher in men with FXTAS than in PMC men and NC men. Nineteen (73.1%) men with FXTAS, 3 PMCs (25%), and 2 (11.8%) NC men had complete loss of AGG interruptions. FXTAS-RS scores were higher in FXTAS participants (median [IQR]: 56.5 ) than in the other 2 groups (p < 0.0001). The total (modified) neuropathy score was 6 (IQR 5) in those with FXTAS, 4 (IQR 5) in PMCs and 0 (IQR 0) in NCs. Eighty-four percent (p = 0.003) of men with FXTAS had a family history of FXS. Participants who met the diagnostic criteria for FXTAS included 2 with possible, 10 with probable, and 14 with definite FXTAS. In men, there was a difference in all molecular variables (p < 0.01) among the 3 groups (table 2). Pairwise comparisons of the molecular results were only significant when comparing normal vs FXTAS and normal vs PMC, but not when comparing PMC vs FXTAS. ROC curve analysis indicated that ASFMR1-TV2 has a good discriminating power of FXTAS in men (figure 1, A-F). The area under the curve (AUC) was 0.80 (95% CI = 0.68, 0.92). LASSO logistic regression analysis with the adjustment of age showed that loss of AGG (coefficient = −0.55) has strongest relationship with FXTAS, followed by a larger CGG repeat size (coefficient = 0.47) and an elevated ASFMR1-TV2 level (coefficient = 0.21). Coefficients for other independent variables including family history of FXS, nonspliced ASFMR1, total ASFMR1, and FMR1 were shrunken to zero by the LASSO model, which indicates that these variables did not have a strong relationship with FXTAS. Thirteen participants who met the criteria for FXTAS, with a mean age of 69.8 ± 11 years, had an average CGG repeat length of 92.2 ± 15.1 (table 3). Forty-four PMCs without FXTAS, with a mean age of 50.3 ± 14.4 years, had an average CGG repeat length of 89.5 ± 19.6. Twenty-two NCs, with a mean age of 56.4 ± 14.5 years, had an average CGG repeat length of 31.6 ± 4.7. Women with FXTAS were older than PMC and NC, and the CGG repeat size was higher in women with FXTAS than in PMC women and NC women. Thirteen (100%) women with FXTAS, 32 PMCs (71%), and 2 (9%) healthy women had complete loss of AGG interruptions. FXTAS-RS scores were higher in FXTAS participants (median [IQR]: 30 ) than in the other 2 groups (p < 0.0001). The total (modified) Neuropathy Scale score was 2 (IQR = 2) in those with FXTAS, 1 (IQR = 3) in PMC and 0 (IQR = 1) in NC women (p = 0.01). More than 90% of women with FXTAS and PMCs had a family history of FXS. Participants who met the diagnostic criteria for FXTAS included 3 with possible, 4 with probable, and 6 with definite FXTAS. In women, ASFMR1-TV2 levels, total ASFMR1 levels, and FMR1 levels were different among the groups (table 4). 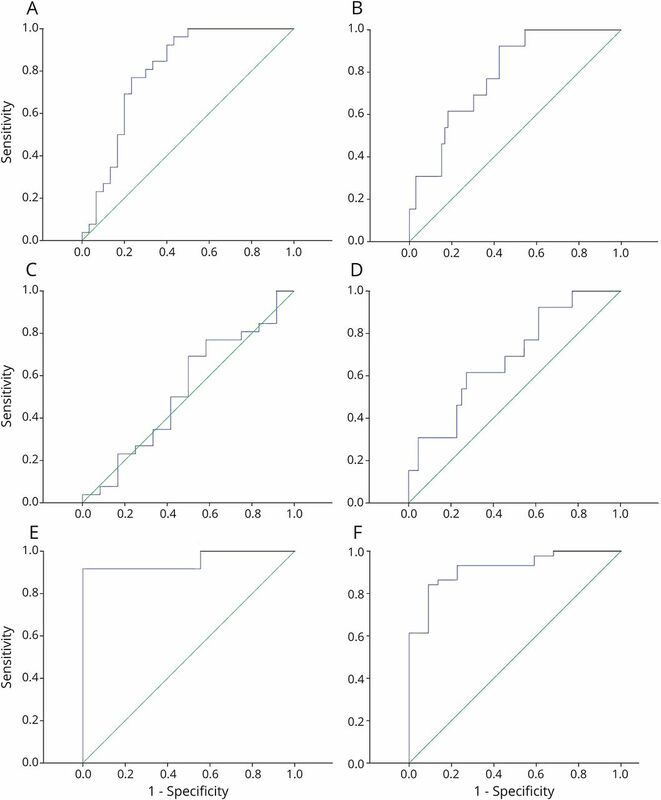 There were no differences in the nonspliced ASFMR1 levels among the groups. In women, pairwise comparisons of the molecular results were significant when comparing between NC vs FXTAS and NC vs PMC, but were not when comparing PMC vs FXTAS. ASFMR1-TV2 showed a good discriminating power of FXTAS from the ROC curve analysis (figure 2, AUC = 0.8, 95% CI = 0.67, 0.9). LASSO logistic regression, adjusting for age, showed that the loss of AGG (coefficient = −0.5555) has the strongest relationship with FXTAS, followed by ASFMR1-TV2 (coefficient = 0.4747) and total ASFMR1 (coefficient = 0.2121). Other variables including family history of FXS, nonspliced ASFMR1, AR, CGG repeat size, and FMR1 did not show a strong relationship with FXTAS from the LASSO regression model. In men, we found a negative correlation between the CGG repeat size and the ratio of the splice variant and total ASFMR1 mRNA among the NCs (correlation coefficient = −0.62, p = 0.04), but a positive correlation among the PMCs (correlation coefficient = 0.81, p < 0.0001). In women, there was also a negative correlation among the controls (correlation coefficient = −0.74, p = 0.02), but no correlation was found among the PMCs (CGG was adjusted for AR) (correlation coefficient = 0.08, p = 0.70). This is the first study to evaluate ASFMR1 splice variant levels in PMCs and FXTAS patients. The reason this study concentrated on ASFMR1-TV2 (figure 2) was because small unpublished studies suggested that this splice variant of the ASFMR1 transcript might be associated with neurologic symptoms in FXTAS men. This study reports elevated levels of ASFMR1-TV2 in FXTAS and a loss of AGG interruptions in men with FXTAS. In addition, this study also showed that the FXTAS-RS and Neuropathy Scale scores were higher in patients with FXTAS compared with PMCs and NCs. We were not able to distinguish between PMCs and FXTAS with pairwise comparisons of ASFMR1-TV2, nonspliced ASFMR1, total ASFMR1, or total FMR1. Although we found that ASFMR1-TV2 and lack of AGG were more common in FXTAS, the power to discriminate between PMCs and FXTAS was not high enough to use alone diagnostically or in a predictive manner. This may be because our sample sizes were too small overall. Some of the groups, such as the PMC men without FXTAS and the FXTAS women group did not have many participants. Because the disease is highly penetrant in men, it was difficult to recruit PMC men without FXTAS. Women with FXTAS were also difficult to recruit because there is a lower prevalence in women. The published criteria for FXTAS3,4 were followed, and because the women have milder features than men with FXTAS, many of them needed either the middle cerebellar peduncle sign or brainstem white matter lesions to qualify for probable FXTAS. Thus, the strict application of the diagnostic criteria leads to the high number having the MCP sign rather than our population of FXTAS women being different from the populations that have been published in the past. Alternatively, the patterns of relationships found may indicate that regardless of the sample size, elevated RNA products from the repeat-containing gene are a phenomenon more related to just the presence of a premutation, rather than reflecting a threshold of abnormal RNAs at which symptoms occur. RAN translation has been described in FXTAS as a potential additional mechanism of toxicity independent of the presumed RNA toxicity. Measurement of RAN translation products could be more closely correlated with amount and on the time of the onset of symptoms. Additional studies may be warranted to combine molecular and other biomarkers, such as examination, imaging, or laboratory markers, to increase the positive predictive value and the clinical utility. Both AUG-initiated and repeat-associated non-AUG (RAN) translation have been shown to occur from ASFMR1 CCG repeats.28 Associated transcripts are capable of forming strong secondary structures in vitro, either RNA hairpins or G-quadruplexes, and are important to the process underlying RAN translation. It is yet unknown if secondary structures linked to ASFMR1-TV2 may also be linked to RAN translation and whether toxicity occurs from the expression of proteins generated from translation of this variant. Pilot work from our research group suggests an association between the lack of AGG interspersions in FMR1 PMCs and higher rates of neurologic signs, which was confirmed in this study. It is recognized that the results regarding the lack of AGG interruptions may represent instead a relationship with the longest pure CGG repeat size. The loss of AGG interruptions is seen in PMCs at a much higher rate than NCs because it makes these repeats more unstable and hence more likely to expand meiotically and (presumably) somatically in tissues. Similarly, one would presume that PMCs with fewer AGG interruptions would have larger pure repeats. Then, these larger pure repeats are associated with enhanced transcription of the FMR1 and ASFMR1 loci because of changes in local chromatin.29,30 Additional studies are needed to determine which factor is responsible for the association. It is important to find molecular markers that can serve as screening tools and increase diagnostic certainty, not only to help families of patients at risk of disorder but also to enable drug discovery, so timely treatment can be implemented. Both PMCs and FXTAS participants had elevated levels of ASFMR1 splice variant 2, and loss of AGG interruptions was associated with FXTAS in men. These markers may have utility if combined with other predictive factors to better predict who will get FXTAS. Additional work also needs to be done to determine the contribution to the mechanism of CCG-mediated toxicity in PMCs. P. Vittal: conception of the study, subject recruitment and neurologic evaluation, skin biopsy, and organizing and writing of the first draft of the manuscript. S. Pandya and K. Sharp: performance of RNA assays. J. Jackson: performance of genotyping and AGG analysis. L. Zhou: performance of genotyping and AGG analysis, fibroblast cultures, and supervision of laboratory assays. B. Ouyang: statistical analysis. E. Berry-Kravis: conception of the study, review and critique of the manuscript, and oversight of laboratory studies. D.A. Hall: conception of the study, subject recruitment, and review and critique of the manuscript. Clinical Research Training Fellowship grant in Ataxia sponsored by the American Brain Foundation and the National Ataxia Foundation. P. Vittal has received funding for travel and/or speaker honoraria and served on speakers' bureaus of Teva Pharmaceutical Industries Ltd and Adamas Pharmaceuticals Inc. and has received research support from the American Brain Foundation and the National Ataxia Foundation. S. Pandya and K. Sharp report no disclosures. E. Berry-Kravis serves or has served on the scientific advisory boards of Vteese, BioMarin, Marinus, Fulcrum, Cydan, GW, and Ovid; holds a patent regarding a method for assay of CCHS-causing polyalanine repeat expansion for diagnosis; receives or has received publishing royalties for The Fragile X Tremor Ataxia Syndrome (FXTAS); consults or has consulted for Fulcrum and Zynerba; and has received research support from Vtesse, Ovid, Neuren, NIH/NICHD, NIH/NCATS, CDC, NIH/NINDS, NIH/NIMH, and the John Merck Fund. L. Zhou, B. Ouyang, and J. Jackson report no disclosures. D.A. Hall served or has served on the scientific advisory board of the National Fragile X Foundation; serves or has served on the editorial board of Neurology Today; consults or has consulted for the NIH; and has received research support from Pfizer, Neurocrine, AbbVie, NIH, Shapiro Foundation, Anti-Aging Foundation, and Parkinson Foundation. Full disclosure form information provided by the authors is available with the full text of this article at Neurology.org/NG. The authors thank the American Brain Foundation and the National Ataxia Foundation for their support of the Clinical Research Training Fellowship grant in Ataxia and Tracy Waliczek and Evelyn Perez for their assistance during skin biopsy and blood sample collection. They thank Integrated DNA Technologies (Coralville, IA) for custom-designed primers and probes. They also thank the participants of this study.
. Fragile x-associated tremor ataxia syndrome: the expanding clinical picture, pathophysiology, epidemiology, and update on treatment. Tremor Other Hyperkinet Mov (N Y) 2012;2.
. Fragile X premutation carriers: characteristic MR imaging findings of adult male patients with progressive cerebellar and cognitive dysfunction. Am J Neuroradiol 2002;23:1757–1766.
. Absence of expression of the FMR-1 gene in fragile X syndrome. Cell 1991;66:817–822.
. FMR1 CGG allele size and prevalence ascertained through newborn screening in the United States. Genome Med 2012;4:100.
. Elevated FMR1 mRNA in premutation carriers is due to increased transcription. RNA 2007;13:555–562.
. CGG repeat-associated translation mediates neurodegeneration in fragile X tremor ataxia syndrome. Neuron 2013;78:440–455.
. Calcium dysregulation and Cdk5-ATM pathway involved in a mouse model of fragile X-associated tremor/ataxia syndrome. Hum Mol Genet 2017;26:2649–2666.
. FMR1 CGG repeat length predicts motor dysfunction in FXTAS. Neurology 2008;70:1397–1402.
. Penetrance of fragile X-associated tremor/ataxia syndrome (FXTAS) in two sisters related to X-inactivation pattern. Ann Neurol 2005;57:144–147.
. Repeat size and X-inactivation in the clinical phenotype of fragile X premutation carrier sisters: a familial case series. Neurol Genet 2016;2:e45. doi: 10.1212/NXG.0000000000000045.
. An antisense transcript spanning the CGG repeat region of FMR1 is upregulated in premutation carriers but silenced in full mutation individuals. Hum Mol Genet 2007;16:3174–3187.
. AGG interruptions within the maternal FMR1 gene reduce the risk of offspring with fragile X syndrome. Genet Med 2012;14:729–736.
. Neuropathic features in fragile X premutation carriers. Am J Med Genet A 2007;143A:19–26.
. Penetrance of the fragile X-associated tremor/ataxia syndrome in a premutation carrier population. JAMA 2004;291:460–469.
. Development of the FXTAS rating scale for quantitative motor analysis. Presented at the 10th International Congress of Parkinson's Disease and Movement Disorders; October 30, 2006; Kyoto, Japan.
. Total neuropathy score: validation and reliability study. Neurology 1999;53:1660–1664.
. Clinical rating scale for tremor. In: Jankovic J, Tolosa E, editors. Parkinson's Disease and Movement Disorders. Baltimore, Munich: Urban & Schwartzenberg; 1987:225–234.
. International cooperative ataxia rating scale for pharmacological assessment of the cerebellar syndrome: the Ataxia Neuropharmacology Committee of the World Federation of Neurology. J Neurol Sci 1997;145:205–211. ; members of the UPDRS Development Committee. Unified Parkinson's disease rating scale. In: Fahn S, Marsden C, Calne D, Goldstein M, editors. Recent Development in Parkinson's Disease. Florham Park, NJ: Macmillan Health Care Information; 1987:153–164.
. A shortened version of the motor section of the Unified Huntington's Disease Rating Scale. Mov Disord 1997;12:229–234.
. Methylation of novel markers of fragile X alleles is inversely correlated with FMRP expression and FMR1 activation ratio. Hum Mol Genet 2010;19:1618–1632.
. 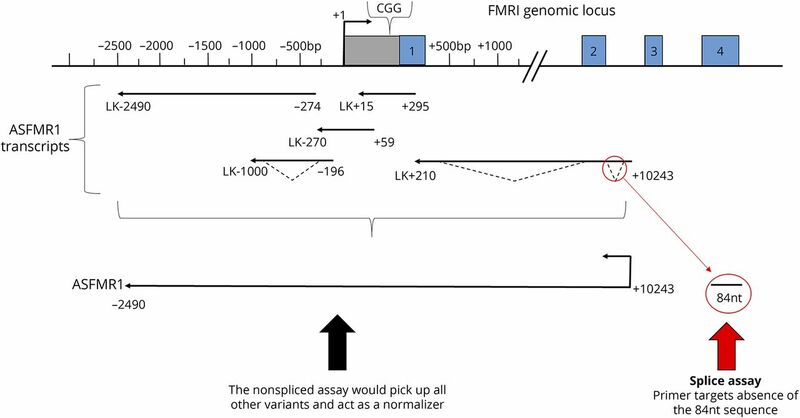 Identification of a gene (FMR-1) containing a CGG repeat coincident with a breakpoint cluster region exhibiting length variation in fragile X syndrome. Cell 1991;65:905–914.
. Repeat-associated non-AUG translation from antisense CCG repeats in fragile X tremor/ataxia syndrome. Ann Neurol 2016;80:871–881.
. Histone deacetylases suppress CGG repeat-induced neurodegeneration via transcriptional silencing in models of fragile X tremor ataxia syndrome. PLoS Genet 2010;6:e1001240.
. CGG-repeat length threshold for FMR1 RNA pathogenesis in a cellular model for FXTAS. Hum Mol Genet 2011;20:2161–2170.